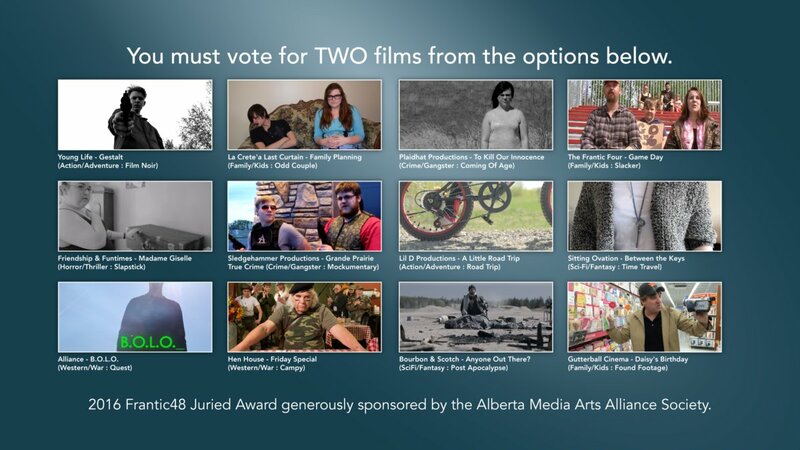 The following teams each produced a film project in the Peace Region as part of the third annual Frantic48 filmmaking competition in April 2016. Their films screened as part of the Reel Shorts Film Festival. All thirteen teams completed their films, and nine completed and submitted their projects within the very difficult 48-hour window. All thirteen were screened as part of the 2016 Reel Shorts Film Festival and the qualifying films were judged by a jury and the audience. Teams were given 48 hours to write, shoot, edit and deliver a 2-7 minute short film. Each team was assigned a random pairing of genres and all teams had to incorporate a prop (a key) and a line of dialogue (“What are you hiding?”). Congratulations to the winning team, Bourbon & Scotch, led by Team Captain Gordie Haakstad. Their film Anyone Out There? won both the Audience Choice Award and the Juried Award (not posted online).